Live stream: The live stream will be available at the AUBG official YouTube channel. Watch the event live on YouTube here. The American University in Bulgaria, in collaboration with Sofia University, is pleased to announce a call for papers for its first conference on “Science Fiction and Communism”. This conference seeks to explore the complex relationship between the communist regime of the past century and science fiction. It also aims to address the cultural, historical, and political contexts of "communist" SF and "communism in SF". We see science fiction not as a mere outcome of state policy or propaganda, but as an active agent in educational strategies, urbanism, and addressing gender issues. The complex relationship between the communist regime and the broader notion of science fiction has opened a discussion, provoked, on one side, by the widespread presence of futuristic symbolism in the regime’s ideological rhetoric and propaganda, and acknowledging, on another, the immense popularity of science fiction during the Cold war period. This discussion can help us unravel important cultural details about the communist regime. Science fiction studies have pointed to the reflective nature of the genre. Though it is usually dismissed as a form of escapism, science fiction voices political and social critiques unattainable by other literary forms. At the core of science fiction is its ability to transform and debate any concept, historical event, or notion. And, in so doing, it directly engages the Cold War’s polemics of lifestyle and social order. Outside of the domain of science fiction, in daily life, in media and architecture, in textbooks and political slogans, the communist regime heavily borrowed futuristic visions and metaphors to establish itself as the bearer of a bright future that had already arrived. Science fiction became a source of political discourse, a language for communicating those slogans and visions. 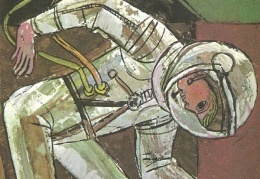 Further, the popularity of the genre, as well as the high expectations for space programs, fueled science fiction-styled trends beyond communist regimes. The wide popularity of science fiction literature and films in the time of so-called "developed socialism" is another important theme in this discussion: why did people in the last decades of the communism esteem science fiction so highly? Why did people, in these turbulent years of social changes, care so much for space travel, for alien beings and alien worlds? What connects the popularity of science fiction and the establishment of a generation’s identity? How should we think about the precarious balance between the state’s agenda with respect to science fiction and the actual outcome and appropriation of science fictional images and ideas? We seek proposals related to representations and discussions of science fiction and communism in literature, film, television, architecture, and so on. The conference is open to all disciplines, approaches, methods, and concepts. We invite submissions and participation from researchers, practitioners, and students. Accepted papers will be invited for publication in a conference volume. Correlations between communist science fiction and the communist modernization project as an alternative to capitalist modernity. In addition to individual paper submissions, we especially encourage abstracts for thematic panels and round table proposals. Proposals for complete panels (three related presentations) must include an abstract, contact information, and a short CV for each presenter. Abstract proposals of up to 500 words and short CVs are due by Friday, February 23, 2018 emailed to Yulia Pechanova at yulia@aubg.edu. We can offer free accommodation to a limited number of guests, please specify should you want to be considered. Otherwise we can assist with local accommodation in small hotels for about 25 USD/night. Participants are responsible for their own traveling arrangements. All inquiries can be directed to Yulia Pechanova at yulia@aubg.edu.